All of a sudden, it’s as if he had never been there. 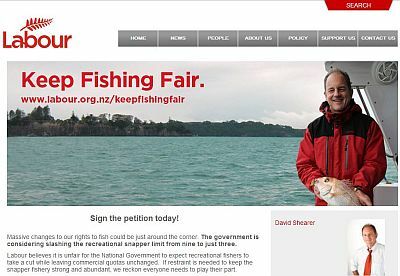 This was the homepage of the New Zealand Labour Party’s website the week before David Shearer announced his resignation. This was the same page last Thursday afternoon, a matter of hours after the announcement. On the same day, Shearer’s own website demoted him to the status of ‘Member of Parliament for Mt Albert, and Labour Spokesperson for Science and Innovation’, even though technically – as he stated in his press conference – he is to remain in charge until a new leader is elected. When the announcement was made, anticipating a move of this nature, it occurred to me briefly that I should go and download as many ‘Shearer pages’, as many speeches as I could. You never know when such documents might become useful, and I remembered how difficult it was for me to track down some of the things that John Key said when he was deputy leader of National, simply because as soon as he became leader his comms people decided that his record had to be reset, and all previous statements in service of another master deleted. So: I knew about this, I fully expected this, and yet I was surprised at how quickly it happened, almost as if a measure of glee was being taken in scrubbing off the old leader’s likeness. Were I in the appropriate mood, I might reach for such historical precedents as the chiselling off of the symbols of a hated dictatorship or, more pointedly, the removal from the photographic record of the people who could no longer be seen to have been close to comrade Stalin. After all, with no hyperbole whatsoever, it’s the exact same logic at work: one that negates history, or rather that asserts the prerogative of power to continually write and re-write the past according to the needs of the present. It wasn’t a big change, but someone had to be instructed to carry it out, on a day that no doubt was tumultuous enough, and for the benefit of whom? A leader as yet unknown, who might come in and restructure not just the party but your very job, oh unknown web grunt. It takes a special dedication to a revisionist view of politics to have bothered to do this at such a moment. Evidently, having removed the linking picture, the staffers in charge of the deletions didn’t bother to actually take the page off the server, so there it now lurks, orphaned, until the next clean-out. In September of 2011, the Labour Party launched its election campaign with a 20-minute party broadcast that can still be found on YouTube. The first five minutes in particular are an object lesson into how to articulate the history of a political organization, and include, most remarkably, a strong disavowal of Rogernomics and everything but the nuclear-free policy of the Fourth Labour Government. Just as remarkably, this section of the broadcast survived a change of leader, and was excerpted and copied onto the party’s website after the defeat at the election, in what seems to me an indication that, if absolutely nothing else, somebody in Labour gets this: that the party’s back story, no matter to what degree it is mythologised, remains its principal asset, that it alone can serve as guarantee – in spite of all evidence to the contrary – of steadfast commitment to a social-democratic project that nobody knows how to spell out any longer, and that might as well itself exist as a black-and-white montage. We are who we are because we were who we were. You need to look no further. 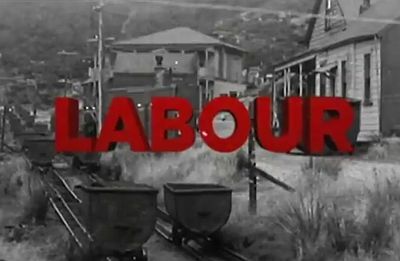 [t]he Fourth Labour Government (1984-1990), led successively by David Lange, Geoffrey Palmer and Mike Moore took difficult and long overdue decisions necessary for the modernisation of the New Zealand Economy. Two histories on the same page, one contradicting the other: that’s what the habit of obsessively manipulating the record will get you. If the recent past is any indication – those reluctant to take Scott Hamilton’s word for it may peruse for themselves the statements by John Jackson and Jack Johnson – the search for the leader that replaces the ghost of David Shearer will be empty of any political content, and the winner will be issued with a blank slate on which to sketch their own version of history. As if there were no power bases, nor constituencies, nor material foundations for the power that is vested into this particular organization. As if its capacity to reinvent itself were limitless. In the meantime, if you hurry, for a few days only you can watch the old leader disappear, bit by bit, statement by statement. He won’t be missed simply because he was never there. This puts truth to the lie, thank you. It's a dammned if you do, damned if you don't scenario. 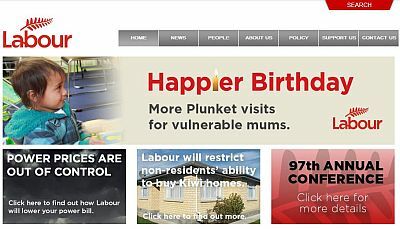 If it weren't done promptly, the usual suspects would be sneering at how Labour can't even keep its website up to date, how can they hope to run a country, etc. "it takes a special dedication to a revisionist view of politics to have bothered to do this at such a moment." No, it really doesn't. It takes one person whose job is looking after the website, and a minute's thought on the part of whoever manages them. What would you say if that was all still there? Perhaps something along the lines of the ghost of Shearer haunting the party, the failure to reflect the present symbolising some sort of disconnect deep in the party? I'm sure you would have come up with something equally telling. "It's a dammned if you do, damned if you don't scenario. 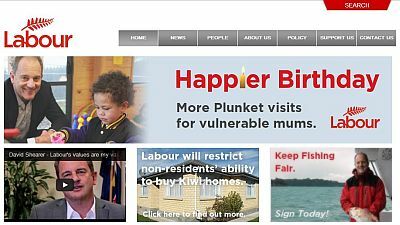 If it weren't done promptly, the usual suspects would be sneering at how Labour can't even keep its website up to date, how can they hope to run a country, etc." I really don't think so. I went to site expecting to see images of the person who is formally still the leader of the party. I was taken aback to find that it wasn't the case. Was it really necessary to deal with him so quickly? The rest of your comment basically alleges intellectual dishonesty on my part, and I find that a bit sad, but c'est la guerre I suppose. "Was it really necessary to deal with him so quickly?" Yes. It was. I said why. I accept you don't think that's compelling, but given the ease with which memes pass from Farrar and Whale to the press gallery's conventional wisdom it's compelling to other people. I think you are reading way too much into something that has obvious, mundane explanations. What happened is neither sinister (Stalin? Really? Is there a Godwin's Law for Stalinism?) nor surprising. That is all. I was present at David Cunliffe's campaign launch in New Lynn yesterday, Giovanni. He was surprisingly up-front about what he believes Labour should stand for - and it bears a reassuring likeness to the first few minutes of that video. If he wins, there will be real economic and social change. It's the best reason for betting against a Cunliffe victory. "Yes. It was. I said why." So you're saying that if people on Thursday evening had seen the images of the person who was at that time still the leader of the party on its website, Labour would have been criticised? And further you are saying that therefore it simply had to be done? But isn’t that kind of making my point? I’m saying that the logic is absurd. I have no problem whatsoever bringing Stalin into it, not just because it’s the most obvious association, but because that kind of manipulation of the record is objectively what was done here. So shouldn’t we perhaps be asking ourselves – as I’ve been doing for the last several years – what relationship between history and politics all this implies? Why is it common practice – I showed it being done by National two years ago – to start this revisionism engine at every new leader, or in this case even between leaders? Should we continue doing this now and forever because otherwise Cam Slater will make fun of us and some journalist will write about it? I brought the example today of two documents on the party’s website: a video, repudiating Rogernomics, and the accompanying text, lauding Rogernomics. I know nobody looks at these things, which I guess is why I’m the only person who’s commented on it. I know how media portray the theatrics of political debates is more important than my opinion. But to me those questions are absolutely central to the immediate future of the Left. If I’m in a minority of one, then so be it, it’ll be all the easier to dismiss my annoying, repetitive views. "Should we continue doing this now and forever because otherwise Cam Slater will make fun of us and some journalist will write about it? " Yup, as long as people concerned with superficialities make fun of these things, and they're influential, tight and indeed ludicrous image managment is required. In its own utterly stupid way, the press commentariat subjects parties' communications to close reading. I had forgotten all about the earlier post you mention. It seems I mistook a broader point about memory and politics for a gratuitous dig. I apologise. "Yup, as long as people concerned with superficialities make fun of these things"
I suppose what I'm saying is that these are not superficialities. These are the superficial symptoms of a far more problematic relationship with change in politics. So while I accept that scrubbing off the leader from the website right away may be the required thing to do, it's also completely deranged. "He was surprisingly up-front about what he believes Labour should stand for - and it bears a reassuring likeness to the first few minutes of that video." I'd like to know whose brainchild that video was because it was so bloody good, and bore no obvious relationship with the crazy left/right hodge-podge that was the Goff 2011 campaign. I was particularly impressed with how it specifically mentioned the fight for inequality as constitutive of the party's politics, alongside the more recent and much more vague appeal to "fairness". But really what I found more surprising and welcome was the "Rogernomics was not Labour's way" part. What tempers any optimism I might have about the outcome of the current process is how the contest was played out last time (hence those candidate statements I linked to). But this time it's not a dress rehearsal, the party actually gets to vote. So maybe the quality of the examination will be different too. Pete: yes, the wayback machine too. That's where I got the first grab in the post.